I took a tiny step today towards being a more professional freelancer. This may seem trivial, but helped me with the commitment. I’m fairly organised, and can keep track of most of my appointments in my head. I don’t usually use a diary or ever appear to write things down. And I don’t forget (well, except a few little things for the IA Summit, but you don’t know how many little details I did manage to remember). But if you didn’t know that, you wouldn’t just trust that I’d remember if I didn’t write things down. So today I decided to take a step in at least looking organised, and bought a diary. 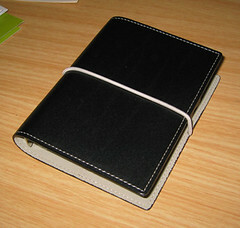 While I like gadgets, I decided that needed too much research, and bought the old-fashioned leather and paper kind. I spent ages in the office supply store. I wanted something small and light, but big enough to be useful. I wanted it to look professional (but not too granny), and definitely didn’t want someone’s brand screaming at me every time I got it out. So I bought this lovely filofax. Look ma, no branding. Just good, solid leather & elegance. I feel like a grown up. This entry was posted on Thursday, April 5th, 2007 at 9:51 pm	and is filed under Freelancing. You can follow any responses to this entry through the RSS 2.0 feed. You can skip to the end and leave a response. Pinging is currently not allowed. Liz. I’m Australian. That’s how we spell it. Is this the Domino? Then it would not be leather. Do you still use it, does it age okay?